The German Air Force (Luftwaffe) flew many photographic reconnaissance missions over the United Kingdom before and during the Battle of Britain. The photographs were analysed, annotated and supplied to bomber crews as target information. Targets were also photographed after they had been bombed and the amount of damage that had been inflicted was assessed. 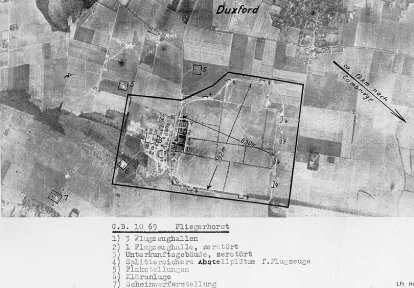 A German aerial photograph of RAF Duxford shows just how much Luftwaffe reconnaissance imagery could reveal about a target and also how what is visible could easily be misinterpreted. 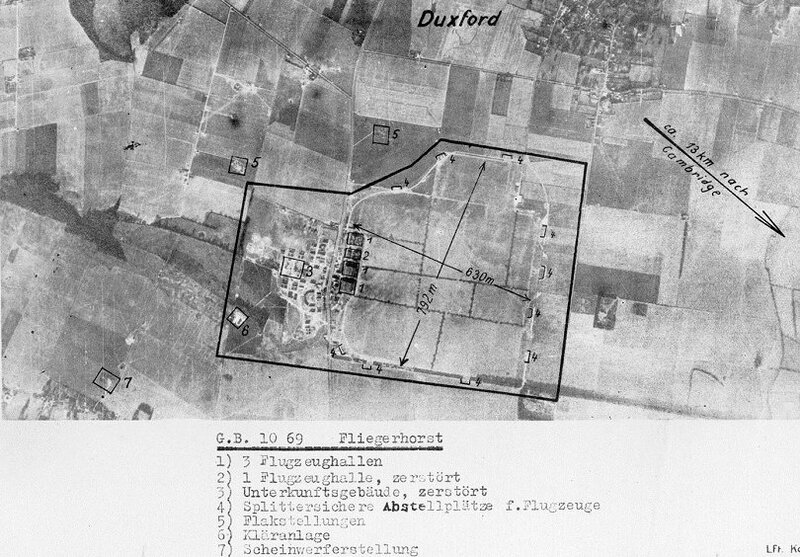 This German Air Force (Luftwaffe) annotated aerial photograph of RAF Duxford was taken on 7 September 1940. The airfield’s domestic accommodation can be clearly seen to the left of the road and the technical site with its hangars (1), grass airfield and fighter pens (4), to the right. The airfield’s sewage plant (6), anti-aircraft guns, (5) and searchlight site (7), are also accurately identified. The Luftwaffe however, wrongly assessed another hangar (2) as destroyed when in fact the building was simply half the size of the other hangars and was completely intact. 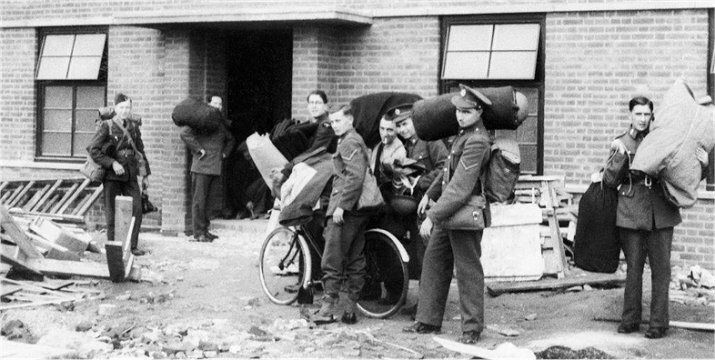 The Germans also assumed that accommodation buildings (3) had been destroyed when they were actually under construction. Another error which must have been very confusing for any potential raiders is the arrow pointing to Cambridge which should point in the opposite direction. Supermarine Spitfire Mark Is of No. 19 Squadron RAF, on display for the press at Duxford. RAF Duxford was the first station to receive the Supermarine Spitfire. In this photograph, Spitfires of No. 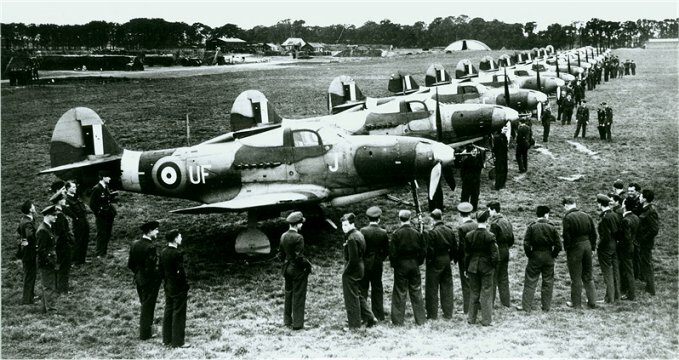 19 Squadron, Royal Air Force (RAF) are lined up outside their hangar in May 1939. The hangar - (1) first from bottom in the Luftwaffe photo, above - dates from the First World War but new squadron offices (to the left of the photo) and camouflage paint were added before the outbreak of the Second World War. This photograph shows the hangar identified at (2) in the Luftwaffe image, above. During the Battle of Britain it was used as the Station Theatre where regular cinema shows, ENSA performances, dances and boxing tournaments were staged. Duxford and Fowlmere were only heavily attacked once during the battle when, on 31 August 1940, a few bombs fell on Fowlmere causing minimal damage. Duxford, October-November 1939 The Royal Air Force expanded before and during the Second World War. The construction of four new barrack blocks to house an influx of additional airmen started at RAF Duxford in the summer of 1939. Building work shown at (3) in the Luftwaffe image, above, was still going on at Duxford as late as September 1940 when the German photograph was taken. Accommodation was so tight that men were moved into the buildings even before they were completely finished. Bell Airacobras of No 601 Squadron at Duxford in 1941. This photograph shows Bell Airacobras of No. 601 Squadron at RAF Duxford in 1941. No photograph exists that shows the aircraft pens at Duxford in 1940 identified at (4) in the Luftwaffe photograph, above, but some of the pens as they were in 1941 can be seen in the top left of this photograph. During the battle, Duxford Spitfire and Hurricane fighters were dispersed around the airfield and kept in earth-walled blast pens designed to protect them. This made aircraft more difficult targets and sheltered them from all but direct hits. Ground crews worked on the fighters outside in all weathers as the aircraft only went into the hangars for complicated maintenance. Squadron pilots spent many tense or boring hours at readiness in huts at the ‘dispersals’, waiting for the call to ‘scramble’ and take off to attack the Luftwaffe. The remains of only one fighter pen can be found at the northern end of the museum site today. German bombs fell near there in 1941, killing two Czech airmen, Duxford’s only ground casualties caused by enemy action during the war. Adolf Hitler had expected the British to seek a peace settlement after Germany’s defeat of France in June 1940, but Britain was determined to fight on. 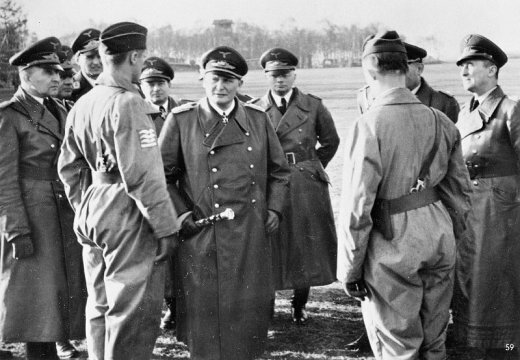 Hitler explored military options that would bring the war to a quick end and ordered his armed forces to prepare for an invasion of Britain – codenamed Operation ‘Sealion’. But for the invasion to have any chance of success, the Germans needed to first secure control of the skies over southern England and remove the threat posed by the Royal Air Force (RAF). A sustained air assault on Britain would achieve the decisive victory needed to make ‘Sealion’ a possibility – or so the Germans thought. The Battle of Britain was ultimately a test of strength between the German Air Force (Luftwaffe) and the RAF. 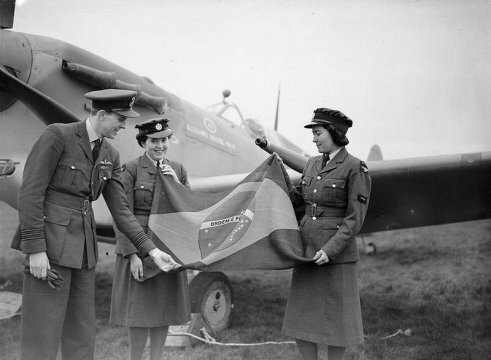 The RAF had become an independent branch of the British armed forces in 1918. Although it developed slowly in the years following the First World War, it went through a period of rapid expansion in the latter half of the 1930s – largely in response to the growing threat from Nazi Germany. In July 1936, RAF Fighter Command was established under the leadership of Air Marshal Sir Hugh Dowding. Germany had been banned from having an air force after the First World War, but the Luftwaffe was re-established by the Nazi government and by 1940 it was the largest and most formidable air force in the world. It had suffered heavy losses in the Battle of France, but by August the three air fleets (Luftflotten) that would carry out the assault on Britain were at full readiness. The RAF met this challenge with some of the best fighter aircraft in the world – the Hawker Hurricane and the Supermarine Spitfire. 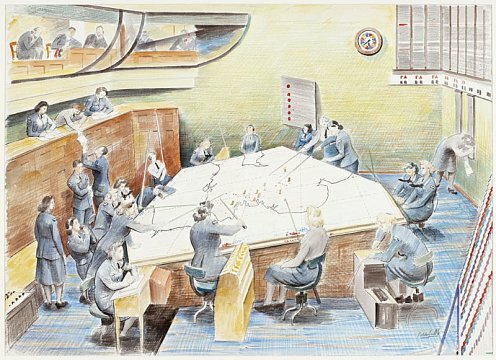 Group Headquarters, Uxbridge: radiolocation plotters, by Roland Vivian Pitchforth. The British developed an air defence network that would give them a critical advantage in the Battle of Britain. The Dowding System – named for Fighter Command’s Commander-in-Chief Sir Hugh Dowding – brought together technology, ground defences and fighter aircraft into a unified system of defence. The RAF organised the defence of Britain into four geographical areas, called ‘Groups’, which were further divided into sectors. The main fighter airfield in each sector – the ‘Sector Station’ – was equipped with an operations room from which the fighters were directed into combat. Radar gave early warning of Luftwaffe raids, which were also tracked by the Observer Corps. Information on incoming raids was passed to the Filter Room at Fighter Command Headquarters at Bentley Priory. Once the direction of the raid was clearly established, the information was sent to the relevant Group’s headquarters. From there it was sent to the Sector Stations, which would ‘scramble’ fighters into action. The Sector Stations received updated information as it became available and further directed airborne fighters by radio. The operations rooms also directed other elements of the defence network, including anti-aircraft guns, searchlights and barrage balloons. The Dowding System could process huge amounts of information in a short period of time. 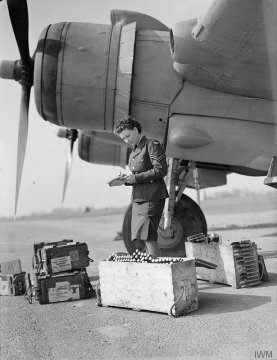 It allowed Fighter Command to manage its valuable – and relatively limited – resources, making sure they were not wasted. 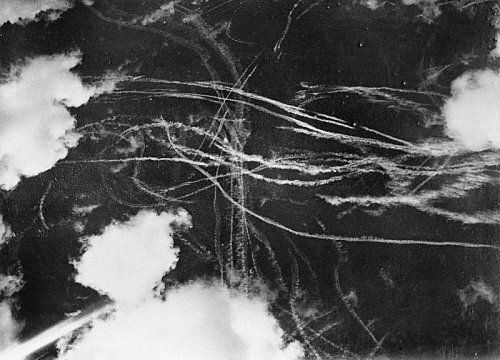 Contrails left by British and German aircraft after a dogfight during the Battle of Britain, September 1940. The Battle of Britain took place between July and October 1940. 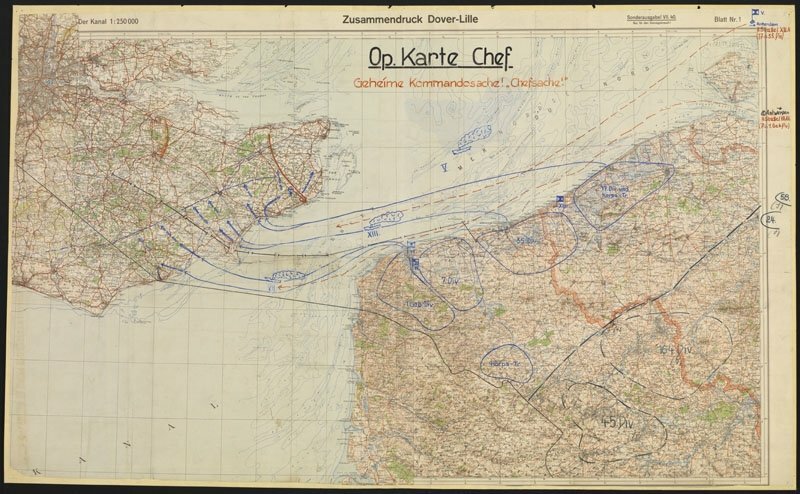 The Germans began by attacking coastal targets and British shipping operating in the English Channel. They launched their main offensive on 13 August. Attacks moved inland, concentrating on airfields and communications centres. 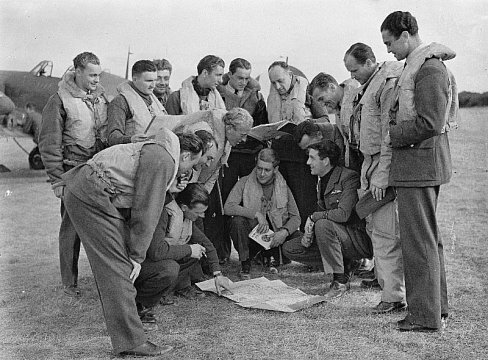 Fighter Command offered stiff resistance, despite coming under enormous pressure. During the last week of August and the first week of September, in what would be the critical phase of the battle, the Germans intensified their efforts to destroy Fighter Command. Airfields, particularly those in the south-east, were significantly damaged but most remained operational. On 31 August, Fighter Command suffered its worst day of the entire battle. But the Luftwaffe was overestimating the damage it was inflicting and wrongly came to the conclusion that the RAF was on its last legs. Fighter Command was bruised but not broken. On 7 September, the Germans shifted the weight of their attacks away from RAF targets and onto London. This would be an error of critical importance. The raids had devastating effects on London’s residents, but they also gave Britain’s defences time to recover. On 15 September Fighter Command repelled another massive Luftwaffe assault, inflicting severe losses that were becoming increasingly unsustainable for the Germans. Although fighting would continue for several more weeks, it had become clear that the Luftwaffe had failed to secure the air superiority needed for invasion. Hitler indefinitely postponed Operation ‘Sealion’. Czech pilots of No. 310 Squadron at RAF Duxford in September 1940. Nearly 3,000 men of the RAF took part in the Battle of Britain – those who Winston Churchill called ‘The Few’. While most of the pilots were British, Fighter Command was an international force. Men came from all over the Commonwealth and occupied Europe – from New Zealand, Australia, Canada, South Africa, Rhodesia (now Zimbabwe), Belgium, France, Poland and Czechoslovakia. There were even some pilots from the neutral United States and Ireland. Two of the four Group Commanders, 11 Group’s Air Vice-Marshal Keith Park and 10 Group’s Air Vice-Marshal Sir Quintin Brand, came from New Zealand and South Africa respectively. The War Cabinet created two Polish fighter squadrons, Nos. 302 and 303, in the summer of 1940. These were followed by other national units, including two Czech fighter squadrons. Many of the RAF’s aces were men from the Commonwealth and the highest scoring pilot of the Battle was Josef Frantisek, a Czech pilot flying with No. 303 (Polish) Fighter Squadron. No. 303 entered battle on 31 August, at the peak of the Battle of Britain, but quickly became Fighter Command’s highest claiming squadron with 126 kills. 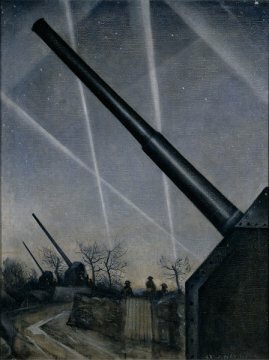 Anti-Aircraft Defences, 1940, by C R W Nevinson. Many people in addition to Churchill’s ‘Few’ worked to defend Britain. Ground crew – including riggers, fitters, armourers, and repair and maintenance engineers – looked after the aircraft. Factory workers helped keep aircraft production up. The Observer Corps tracked incoming raids – its tens of thousands of volunteers ensured that the 1,000 observation posts were continuously manned. Anti-aircraft gunners, searchlight operators and barrage balloon crews all played vital roles in Britain’s defence. Members of the Women’s Auxiliary Air Force (WAAF) served as radar operators and worked as plotters, tracking raids in the group and sector operations rooms. The Local Defence Volunteers (later the Home Guard) had been set up in May 1940 as a ‘last line of defence’ against German invasion. By July, nearly 1.5 million men had enrolled. 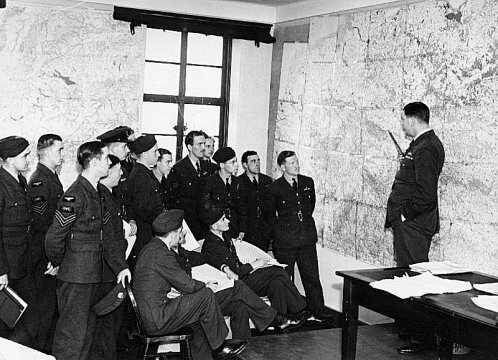 Whitley bomber crews attend a briefing before a raid over Germany, 29 August 1940. The RAF was organised into different ‘Commands’ based on function or role, including Fighter, Bomber and Coastal Commands. While victory in the Battle of Britain was decisively gained by Fighter Command, defence was carried out by the whole of the Royal Air Force. Britain’s most senior military personnel understood the importance of the bomber in air defence. They wrote on 25 May: ‘We cannot resist invasion by fighter aircraft alone. An air striking force is necessary not only to meet the sea-borne expedition, but also to bring direct pressure to bear upon Germany by attacking objectives in that country’. In other words, RAF Bomber Command would attack German industry, carry out raids on ports where Germany was assembling its invasion fleet, and reduce the threat posed by the Luftwaffe by targeting airfields and aircraft production. RAF Coastal Command also had an important role. It carried out anti-invasion patrols, provided vital intelligence on German positions along the European coast and occasionally bombed German shipping and industrial targets. 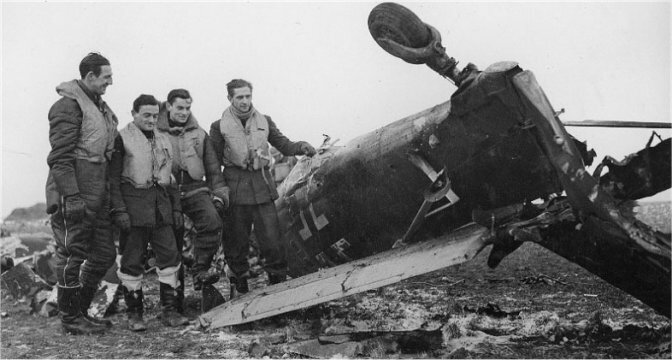 Spitfire pilots pose beside the wreckage of a Junkers Ju 87 Stuka, 1940. During the Battle of Britain, the Luftwaffe was dealt an almost lethal blow from which it never fully recovered. Although Fighter Command suffered heavy losses and was often outnumbered during actual engagements, the British outproduced the Germans and maintained a level of aircraft production that helped them withstand their losses. The Luftwaffe, with its lack of heavy bombers and failure to fully identify critically important targets, never inflicted strategically significant damage. It suffered from constant supply problems, largely as a result of underachievement in aircraft production. Germany’s failure to defeat the RAF and secure control of the skies over southern England made invasion all but impossible. British victory in the Battle of Britain was decisive, but ultimately defensive in nature – in avoiding defeat, Britain secured one of its most significant victories of the Second World War. It was able to stay in the war and lived to fight another day. Victory in the Battle of Britain did not win the war, but it made winning a possibility in the longer term. Four years later, the Allies would launch their invasion of Nazi-occupied Europe – Operation ‘Overlord’ – from British shores, which would prove decisive in ultimately bringing the war against Germany to an end. 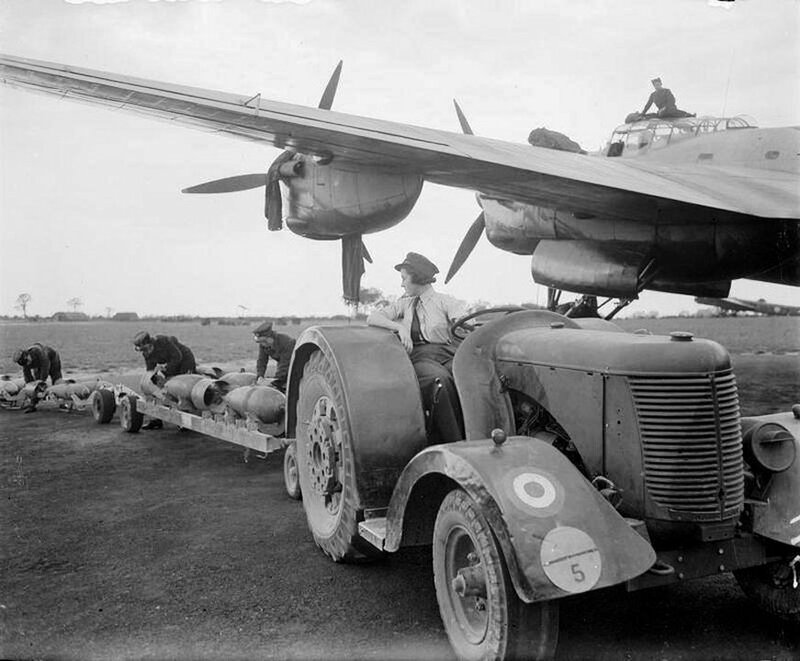 Motor transport driver at the wheel of a tractor that has towed the bomb train. .
presented by the Brazilian Fellowship of the Bellows to the RAF on April 10th 1943.
lorry driven by a WAAF, Scampton, 2 October 1940. .
No. 96 Squadron RAF at Honiley, Warwickshire. 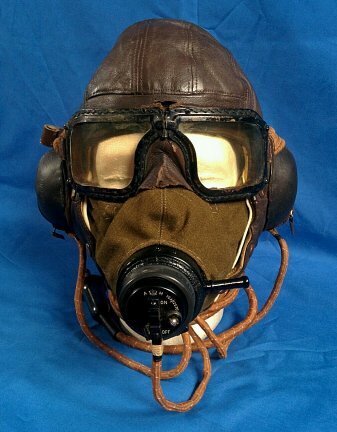 WWII RAF B-type flying helmet/D-type oxygen mask/mkIII flying goggles grouping. A set, comprising of an original B type helmet, original mkIII goggles and a fantastic reproduction Sefton D-Type mask. therefore making that factory a bombing target.